When it comes to workplace safety, traffic safety is an often-overlooked area of vulnerability. To help keep your traffic areas safe, 1st Resource Solutions offers a complete line of traffic safety solutions. Traffic safety cones, orange cones, cone topper and belt barrier, safety drum, delineator post can help get traffic moving in the right direction and help to block off potential hazards, while high visibility safety vests and lighting can help keep your employees who help manage traffic safe on the job. For personalized service, or to request a special price quote, contact our team of sales experts, or call 1-800-803-1030. We are happy to help you determine the suitability of a given traffic safety cone and barrel products for your intended application. Traffic Safety Cones Offer Quick Set-Up And Removal For A Variety Of Traffic Control And Pedestrian Safety Applications. Start with 1st Resource Solutions for traffic safety cones. Available styles are Non-Reflective, Non-Reflective-Black Base, Reflective and Reflective-Black Base. Heights are 18, 28 and 36 inches with reflective collars. Meets MUTCD standards. Custom Imprinting and orange color available. Tensacone® Barrier Systems Provide Quick And Effective Methods Of Controlling Pedestrian Or Vehicular Traffic. 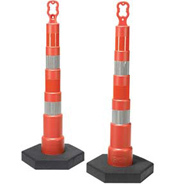 Cone Toppers are designed to easily fit over most standard traffic cones. Include 7-1/2 feet of high visibility chevron webbing which connect the cones together. 4 way connectivity make them versatile and easy to configure. 3 inch diameter, 9 inch high durable plastic toppers are available in Blue, Green, Orange or Yellow color. Diagonal stripped webbing comes in choice of Black/Yellow, Blue/White, Green/White and Red/White combinations. Safety Posts are ideal for both indoor or outdoor use. Plastic Traffic Control Drums Bounce Back After Repeated Impacts. These drum barricades are made from tough, resilient high density plastic. Barricade drums meets NCHRP requirement 350. Traffic safety drums include four 4"W reflective sheeting bands available in economical engineered grade or high intensity grade strips. EZ Grab Delineator Posts Are Ideal To Highlight Outdoor Areas Or Traffic Circles For Hotels, Hospitals, Schools And Industrial Plants. Delineator Posts are made of 100% impact-resistant, polyethylene material with 100% recycled rubber base for long lasting durability. Post is NCHRP-350 Certified and stands 45" high. EZ Grab handle provides portability and ease of movement.